It did not look like there was going to be a bright sunrise, but as I was getting closer to Bow Lake, I could see the colours through my rear view mirror. I decided to pull into the lake’s parking lot and quickly made my way to the shore. It was November, I was able to find some open water, then started taking pictures. If you have some clouds and some clear sky, there is a good chance of an interesting sunrise. Its worth heading to the Vermilion Lakes for, setting up the camera equipment and waiting for the sun to rise. Did not get he reds or the oranges, but got some bright warm yellows, a nice contrast to the cool blue on the ground. 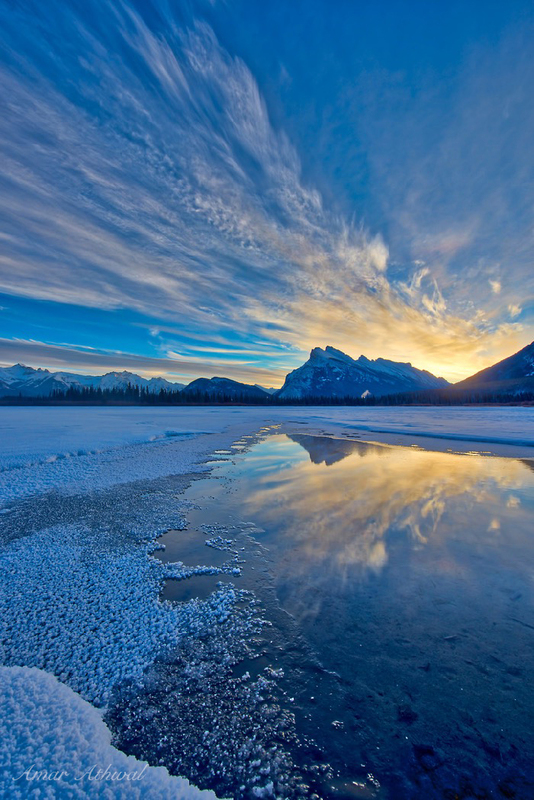 In Mountains, Sunrise Tags Banff National Park, Mountains, Mount Rundle. Sunrises are about scattering light. During sunrises and sunsets, sun is low on the horizon, sunlight has to travel through more of the atmosphere. Colours like blues and violets with shorter wavelength get scattered out by small particles, droplets and molecules in the atmosphere. But letting in longer wavelength colours like yellow, orange and red. The clouds catch the longer wavelength colours and reflect them to the ground. We have been seing beautiful sunrises the last number of weeks along Vermilion Lakes, this was one of them. I always look for a different place to take the picture from, not always possible. But this time it worked out. Sunrises are little more special when there is a reflection in the water. Was back at the Vermilion Lakes to take pictures of Mount Rundle during a sunrise. I never get tired of taking pictures there, knowing I will always come back with something I like. Most of the landscapes pictures I have taken there have been during the mornings. The calm water, Mount Rundle and colourful sky go well together, no exception the last time I was out there. I was bit under the weather, but decided to bundle up and head outside anyway. With me taking too long to decide if I should go, as soon I stepped outside I could see the warm colours in the clouds. Kept my fingers crossed, hoping to make it to the Vermilion Lakes before it was too late. With the heavy winds, there was only one place where I was going to find still water. It was a small area, but that was all I needed. When I saw all the clouds on fire, I forgot about the aching joints and started clicking the camera. It was a morning to remember.